Many of the GO! 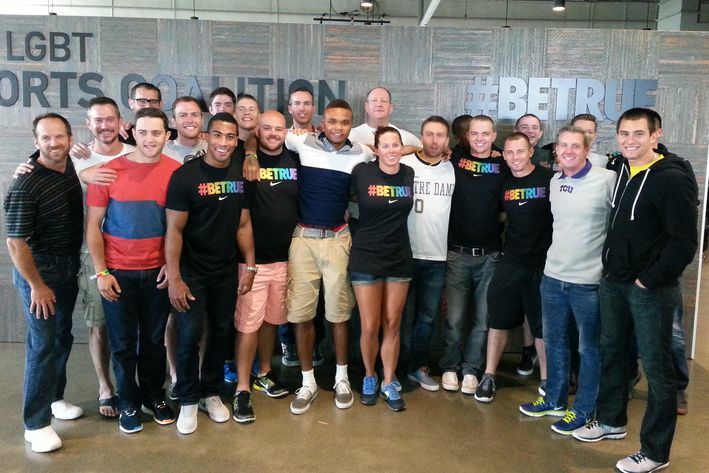 Athletes board members attend the annual Nike LGBT Sports Summit. GO! Athletes has a new board of directors, and they are making a push to connect with as many LGBT athletes, particularly in high school and college, as they can. Executive Director Chris Mosier is an inspiration to LGBT athletes. He is dedicated to advocating for trans people in sports, and he is a triathlete. In 2013, he launched the website transathlete.com as a resource for students, athletes, coaches, and administrators to get educated about trans issues. Chris can help LGBT athletes at all levels and is a great person to talk to about your experiences as an LGBT athlete. Sean Smith, Managing Director, is a former NCAA swimmer and now the Chief of Staff at Imagine Swimming in New York City. As an LGBT athlete, he is a resource for athletes competing at all levels. Sean can help you by sharing his experience with working hard and overcoming adversity as an out athlete. He is extremely dedicated to building relationships and friendships with the members of our network, and would love to have you join us as a member of GO! Athletes. As the GO! Director of Strategic Initiatives, Nora Cothren is looking forward to her role as an opportunity to guide our network to the next level. She is a former captain and ice hockey player at Smith College. She loves the GO! community and has met many amazing people through her time with GO! Nora believes that each person brings a new perspective that can spark conversation and help us see issues and concepts from different angles. Katie Barnes, the 2015 Network Director, is a former basketball player and a coach. Katie is passionate about making sports environments safe for all people, regardless of their sexual orientation, gender identity, or gender expression. Current and former LGBT athletes and coaches can look to Katie as a role model for inclusion and courage as an out member of the LGBT community. Through the GO! network, they work to build communication in the LGBT community through conference calls. Josh Sanders, our Director of External Engagement, speaks across the nation about intersectional issues such as religion, homophobia, sexism, racism, and other topics. He believes that sports are a catalyst for changing culture and impacting the world for the better. As our Director of External Engagement, his mission is to build on our goals of engaging, educating, and empowering LGBTQ athletes and others. Josh will lend a helping hand to young athletes who have struggled with their identities and faced negative situations due to their sexuality or gender identity, in order to make sports an inclusive and positive experience in their lives. Monica Rochon, our Director of Educational Leadership, is a running back for the Tampa Bay Inferno tackle football team. They believe political education is critical to understanding the history of oppression, power, privilege, and the intersections of identity. As the, GO! director of educational leadership, they want to give social justice education opportunities to current and former athletes. Young LGBT athletes can reach out to Monica to learn about and discuss important issues surrounding race, gender, and sexuality in sports, as well as how to establish a GO! Chapter at their schools. I’m proud to say I was given the Director of Social Media and Digital Initiatives position and the opportunity to work with these amazing people. I have been swimming since I was 8 years old, competing from age group events to the Olympic Trials and NCAA competitions. Coming from a place where there aren’t many other LGBT athletes, I felt like I fit in with GO! and was more confident being a part of the group. I would love to have you reach out to us via social media, so we can start important conversations about issues and solutions that you are passionate about, and provide you with support. Our board is excited to be working together towards inclusion, and helping LGBT youth. We encourage you to reach out to any of us through our social media platforms. Promoting equality in sports is a team effort, and we want you on our team. You can check out our website: goathletes.org and learn more about the GO! Athletes network. Check out GO! Athletes on their Web site or Facebook page.